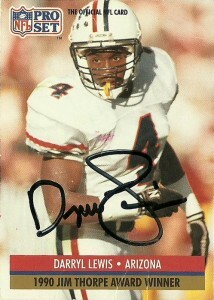 Darryl Lewis was a player on the Oilers I liked to watch a lot, as he outperformed expectations despite his size. A consensus All-American and Jim Thorpe Recipient in 1991, great hands, productivity, deceptive speed, and leaping allowed Lewis to keep pace with many of the best wide receivers in the game and well into his career as a professional. A member of the Houston Oilers Young Guns secondary, Lewis played for the Oilers/Titans, Chargers, and Broncos over an 11 season career. I got his autograph via the team back in 1993 on my birthday, and always wanted to circle back around and get his again on these two cards I had. He did some coaching at Oregon State with Mike Riley but unfortunately Lewis has had legal issues and had been detained for a few years. Recently he has been granted his release. Since I had always wanted to get his autograph on this Pro Set card, I went ahead and took a shot at the former Oiler/ Charger DB where he lives near San Diego. 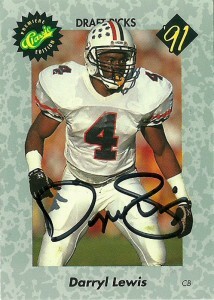 This Classic 1991 card I had is probably among the ugliest ever produced outside of the Fleer 1991 entry. These cards are both considered error cards as they misspell Darryll’s name as “Darryl”.